Brachypodium is named for its features. Brachy is Greek for "short" and podion is Greek for "little foot". "Short footed" refers to the small pedicels of the spikelets (3, 19, 21). The Brachypodiums are economically significant only as an invasive weed species, which crowd out other species. 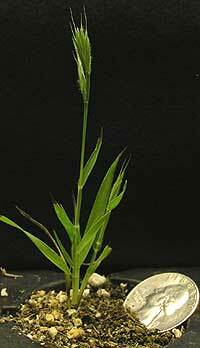 However, genomic studies may prove Brachypodium distachyon to be more useful. Its phylogenetic status has been full of controversy, and is described more fully in Catalan (4), However, recently scientists have reclassified it into its own tribe Brachypodieae based upon cytological, anatomical and physiological studies (9). A perusal of several on-line databases identifies between 5 and 15 species (2, 12, 17). Brachypodium is related to the major cereal grain species but is understood to be more closely related to the Triticeae (wheat, barley) than to the other cereals. The focus of this article will be on Brachypodium distachyon, commonly called Purple False Brome, although other species will be briefly discussed. Similar to the model plant, Arabidopsis, Brachypodium distachyon has several features that recommend it as a model plant for functional genomic studies, especially in the grasses. Traits that make it an ideal model include its small genome (~355Mbp), small physical stature, a short lifecycle, and few growth requirements. (5, 6, 8, 14). Although rice has historically been used as the model organism for grasses, it has some drawbacks which may rule it out as the best model for addressing the growing conditions, post-harvest biochemistry and pathogenic response of temperate cereals (8). Rice is not a temperate grass, and is physically much larger and temperamental to grow, and it is more distantly related to the Triticeae wheat, barley and rye than Brachypodium. Brachypodium, with its polyploidy accessions, can serve as an ideal model for these grains (whose genomics size and complexity is a major barrier to biotechnological improvement), as well as for forages and turf grass (5, 14). B. distachyon also has homologs for genes currently thought to synthesize the lignin precursors essential for biofuels (18) and therefore holds promise as a model organism herbaceous biofuel crops such as Switchgrass. Bennett, MD & Leitch, IJ. 2005. Nuclear DNA Amounts in Angiosperms: Progress, Problems and Prospects. Annals of Botany 95, 45-90. Board of Trustees, Royal Botanic Gardens, Kew. The Online World Grass Flora (GrassBase) http://www.kew.org/data/grasses-db.html. [Accessed 1/8/07]. California plant names: Latin and greek meanings and derivations: A dictionary of botanical etymology. Compiled by Michael Charters. Website http://www.calflora.net/botanicalnames/. [Accessed 1/8/07]. Catalan P, Shi Y, Armstrong L, Draper J, Stace CA. 1995. Molecular phylogeny of the grass genus Brachypodium P. Beauv. based on RFLP and RAPD analysis. Botanical Journal of the Linnean Society, 117, 4, pp. 263-280. Center for Genome Research and Biocomputing, The. http://www.brachypodium.org/ [Accessed 10/08/06]. Dept. of Molecular Plant Pathology, University of Wales at Aberystwyth. Brachyomics. http://www.aber.ac.uk/plantpathol/brachyomics.htm. [Accessed February 28, 2007]. Dept of Rangeland Ecology and Management, Texas A&M University. S M Tracy Herbarium. http://www.csdl.tamu.edu/FLORA/taes/tracy/610/brachypodium.html. [Accessed 1/8/2007]. Draper J, Mur LA, Jenkins G, Ghosh-Biswas GC, Bablak P, Hasterok R, & Routledge AP. 2001. Brachypodium distachyon. A new model system for functional genomics in grasses. Plant Physiology 127: 1539-1555. Hasterok R, Draper J, & Jenkins G. 2004. Laying the cytotaxonomic foundations of a new model grass, Brachypodium distachyon (L.) Beauv. Chromosome research : an international journal on the molecular, supramolecular and evolutionary aspects of chromosome biology 12: 397-403. Hasterok R, Marasek A, Donnison IS, Armstead I, Thomas A, King IP, Wolny E, Idziak D, Draper J, & Jenkins G. 2006. Alignment of the genomes of Brachypodium distachyon and temperate cereals and grasses using bacterial artificial chromosome landing with fluorescence in situ hybridization. Genetics 173: 349-362. Hussey BMJ, Keighery GJ, Cousens RD, Dodd J & Lloyd SG. 1997. Western Weeds, A guide to the weeds of Western Australia. http://members.iinet.net.au/~weeds/pps_publications.htm. ITIS - Integrated taxonomic information system on-line database. http://www.itis.gov. [Accessed 1/8/07]. The Regents of the University of California. 2001. Why Sequence Brachypodium? http://www.jgi.doe.gov/sequencing/why/CSP2007/brachypodium.html. [Accessed Jan 8, 2007]. USDA, ARS. Brachypodium genome resources project. Website http://brachypodium.pw.usda.gov/. [Accessed 1/8/07]. USDA Forest Service, USDI Bureau of Land Management, Oregon Department of Agriculture, US Army Corps of Engineers, OSU College of Forestry, Institute for Applied Ecology, Starker Forests Inc., The Nature Conservancy, Native Plant Society of Oregon. 2003. Invasive Plant Alert False-brome (Brachypodium sylvaticum). Prepared by Thomas Kaye. http://www.appliedeco.org/Reports/BRSYbrochure.PDF. USDA, NRCS. (2006). The PLANTS Database (http://plants.usda.gov), 16 October 2006. National Plant Data Center, Baton Rouge, LA 70874-4490 USA. Vogel JP, Gu YQ, Twigg P, Lazo GR, Laudencia-Chingcuanco D, Hayden DM, Donze TJ, Vivian LA, B. Stamova B, & Coleman-Derr D. 2006. EST sequencing and phylogenetic analysis of the model grass Brachypodium distachyon. TAG.Theoretical and applied genetics. 113: 186-195. Watson, L and Dallwitz, MJ. 1992 onwards. The grass genera of the world: descriptions, illustrations, identification, and information retrieval; including synonyms, morphology, anatomy, physiology, phytochemistry, cytology, classification, pathogens, world and local distribution, and references. Version: 28th November 2005. http://delta-intkey.com. [Accessed 8 January, 2007]. Wikipedia contributors, 'Brachypodium distachyon', Wikipedia, The Free Encyclopedia, 6 September 2006, 10:03 UTC, http://en.wikipedia.org/w/index.php?title=Brachypodium_distachyon&oldid=74106473. [Accessed 8 January, 2007]. Wilken DH. 1993. Brachypodium. From The Jepson Manual, Copyright Â© 2007 Regents of the University of California. Available online at http://ucjeps.berkeley.edu/cgi-bin/get_JM_treatment.pl?8738,8852,8853. [Accessed 1/8/07].